1a. Email Ray Banks, 20 januari 2016: FGC6629 was found in Boed, FGC34750 was found in Mr. Nolet and FGC42426 was found in Martin. I have listed just a few of your unique mutations so we can keep track of them. I could not find any mutations that were shared by just two of the three men with sequencing. Because of some differences in the sequencing tests and my elimination of some mutations in duplicated regions of the Y that were reported, I am having a hard time determining a time relationship. But it seems all three of you share a common ancestor who lived perhaps 1500 to 2500 yrs ago. And so far the evidence is that the earlier ancestors lived in a small family-type group for a very long time. dans la région du quartier de DYS19 (b37 Y: 9521934 .. 9522128 accordéon chose à Ybrowse) Nous ne voyons plus que RI426A semble avoir à peu près le double de la couverture typique de la région autour de DYS19. En particulier, il semble que il ya une duplication de la région à peu près de 9517470 à 9525057 (b37) (environ 7,5 kb). Donc, ce qui suggère thatthere est un bon RI426A chance C'est en effet DYS19 = 15-15 en raison de cette mutation de la duplication apparente. 4. Comparaison des haplotypes et déterminer la distance génétique ne devraient être utilisés quand il ya des indications de parenté. Le généticien Sykes a montré cela dans le clan écossais Donald. Cette vieille famille écossaise a une histoire de famille bien documenté qui remonte profondément dans le Moyen Age. Chez John, Seigneur des Isles, décédé en 1386, provenaient trois branches de la famille, tous sont alors ramification plus loin. Dans dix branches des gens laissent tester leur Y-ADN. La différence dans le nombre de mutations par branche en six cent ans, c'est 20 à 22 générations, avec 38 marqueurs testés, varie de 1 à 5. Dit Amerikaanse bedrijf onderzoekt het gehele genoom op erfelijke afwijkingen. Zij vergelijken de genenpakketten ook met andere invalshoeken, zoals de verschillen in de etnische herkomst. Zij noemen dit Ancestry composition. Zij vinden: 99,8 % Europees, waarvan Frans en Duits: 47,5 %, Brits 17,1 %, Scandinavisch 1,1 %, Algemeen Noordwesters Europees 26,3, Iberisch 2 %, Balkan 1%, Sardinisch 0,3 %, Algemeen Zuid Europees 1,2 %, algemeen Europees 3 %, en West Afrikaans 0,1 %. Door DNA-land worden de waarden van 23andMe gebruikt. FTDNA gebruikt Family finder. Wanneer je bij meerdere maatschappijen je DNA op ethnische herkomst laat testen krijg je leuke verschillen. Opmerkelijk is de 5% Jewish Diaspora die FTDNA vindt. Deze firma heeft echter een shkenasische eigenaar. 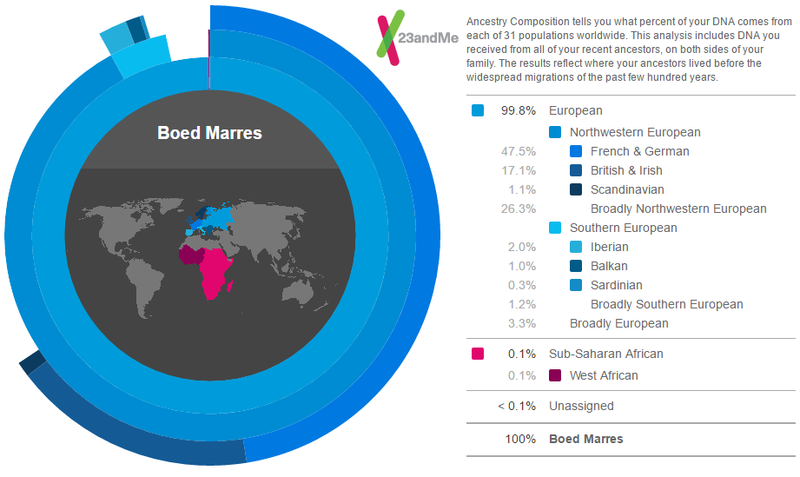 Nota Bene: Maciamo Hay, What really hides behind the 23andMe Ancestry Composition? Do the component names actually match the region's names? I have analysed the data, created distribution maps for each ancestry component, and tried to determine the source of each ancestry component. While 23andMe originally claimed that these components were about 500 years old, I found that a timescale of 1500 to 2500 years was more realistic. Therefore each component refers to ancient ancestry, not modern one. 3. Parmi ces trois familles, le chromosome Y a été entièrement étudié (séquencé). Ils ont tous 112 SNPs en commun. Les familles Marres et Nolet ont les deux 10 SNPs propres. La Famille Slootmaekers a 11 SNP's. 4. Email Ray Banks, januari 20, 2016: FGC6629 was found in Boed, FGC34750 was found in Mr. Nolet and FGC42426 was found in Martin. I have listed just a few of your unique mutations so we can keep track of them. I could not find any mutations that were shared by just two of the three men with sequencing. Because of some differences in the sequencing tests and my elimination of some mutations in duplicated regions of the Y that were reported, I am having a hard time determining a time relationship. But it seems all three of you share a common ancestor who lived perhaps 1500 to 2500 yrs ago. And so far the evidence is that the earlier ancestors lived in a small family-type group for a very long time. 6. Menabdishvili has about 144 private SNPs listed (FullGenomes, probably including medium quality) and Hendon about 90. They share only 4 SNPs. Usually BigY detects about half of one sample's SNPs, so they can probably share a maximum of 8 SNPs. If we use 75 years/SNP, it appears that the common ancestor lived 10800 years ago (144*75). Adding 600 years for the common SNPs gives 11400 years, which is the actual age of PF3177 indicated by YFull. (Information Julian Red) (Retour) . 16. For Belgium there is the DNA Project Oud Hertogdom Brabant, publicated 11 January 2013. It has 1058 participants of whome the great majority, 834 men, is from the Dutch speaking part of Belgium, a tiny part, 55 men, is Francophone Walloon, but also are included 159 Dutch men of the province Noord Brabant bordering Belgium. The Belgium provinces Liege, Namur and Limburg have the highest rates G. Of the 124 men are 9 G, which is 7,3 %. - Christopher R. Gignoux et al., Harvard University Cambridge, USA, Rapid global demographic expansions after the origins of agriculture. "Comparisons of rates of population growth through time reveal that the invention of agriculture facilitated a fivefold increase in population growth relative to more ancient expansions of hunter-gatherers." in Proceedings of the National Academy of Sciences, 2011. - Marcel Mazoyer and Laurence Roudart, Histoire des agricultures du monde. in the english translation by James H. Membrez, A History of world agriculture from the neolithic to the current crisis, New York 2006. - Jens Lüning, Albrecht Jockenhhövel, Helmut Bender, Tortsen Capelle, Deutsche Agrargeschichte Vor- und Früh­geschichte, 1996.